The Latest Range Rover Sports in Stunning White with Contrast Black Roofs for your most modern Weddings in Melbourne. 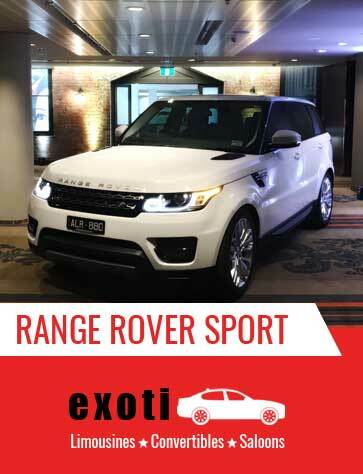 At Exoticar, we pay attention to detail as we know every little detail has an impact and we make sure you feel like a star on your special day.Range Rover sports gives you the complete control on the road. Its looks are stunning and when you enter in this vehicle, you will feel the high quality interior. It helps you to increase your standard. Once you have a ride in this car, you wish to travel in it again and again. The Range Rover Sport is the most luxurious and comfortable vehicle to hire for a special occasion. Whether it is your wedding, birthday, business events or meetings and so forth. This vehicle makes you feel special in your special moment. If you are searching to hire this vehicle, just contact to the given number. We are always prepared to serve our customers. We guarantee that you will be completely satisfied with our services.